History was made at The BCG on Tuesday evening when Belvoir fielded an all girls team for the first time. 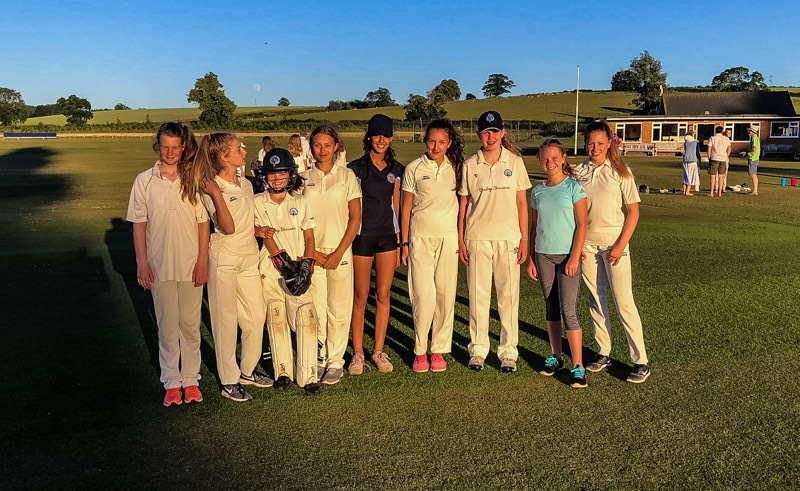 Captained by the very experienced Leicestershire player Olivia Gilbertson (13) Belvoir batted first on a beautiful summers evening. The Opening pair of Olivia and Phoebe Lyle batted superbly, putting on 27 without losing a wicket to get us off to a great start. Georgie Moreley and Lizzy Hibbert-Smith were next to the crease and found the going tough against some accurate bowling. The loss of three wickets reducing our total at the end of 8 overs. Third pair of Olivia Grafton-Morton and Ava Holt batted positively, hitting the ball well but were ultimately hauled back by a couple of excellent catches towards the end of their allotted 4 overs. Roshni Brook and Hannah Blake began to rebuild the innings scoring 12 runs off the bat leaving the final pair of Clemmie Bealby (11) making her Belvoir debut and Olivia Gilbertson batting again to add an excellent 21 without loss. Skipper Olivia opened the bowling with Clemmie maintaining the family tradition and taking the gloves. Excellent bowling and tight fielding kept Belvoir well in the match. There were wickets for Georgie 2-0-6-1, Hanna 2-0-5-1 and a top spell of bowling from Olivia Grafton-Morton 3-1-4-2. Going into the final over Keyworth were still 4 runs behind but a couple of boundaries meant that they got their noses in front to win what was a competitive and tight game, played in a good spirit. It is worth noting that we actually scored more runs off the bat than our more experienced rivals which bodes well for the future of Girls Cricket at Belvoir !